This is the ideal set for any young entomologist to learn about the life cycle of ladybugs, from larvae to full-fledged beauties. It couldn't be simpler! 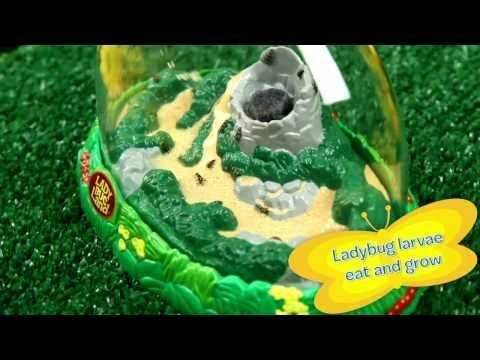 The kit includes the Ladybug Land model with volcano and landscape, protected by a clear dome, and voucher for you to order the ladybug larvae online and have them delivered, ready to go. The 10-20 larvae will come with the food that the lady bugs need. A magnifying glass is built in so that you can watch the ladybugs as they become pupae, and you can feed them with the pipette dropper for watering the volcano that the ladybugs will drink from. Using the instructional booklet, harvesting a bug's life is easier than it ever has been before! Watch your ladybugs fly away when they're totally finished growing, and order in your next crop. Ladybug Land habitat with water reservoir "volcano"